My recipe for Moscato Sangria was first published on Sunday Supper Movement where I am a contributor. 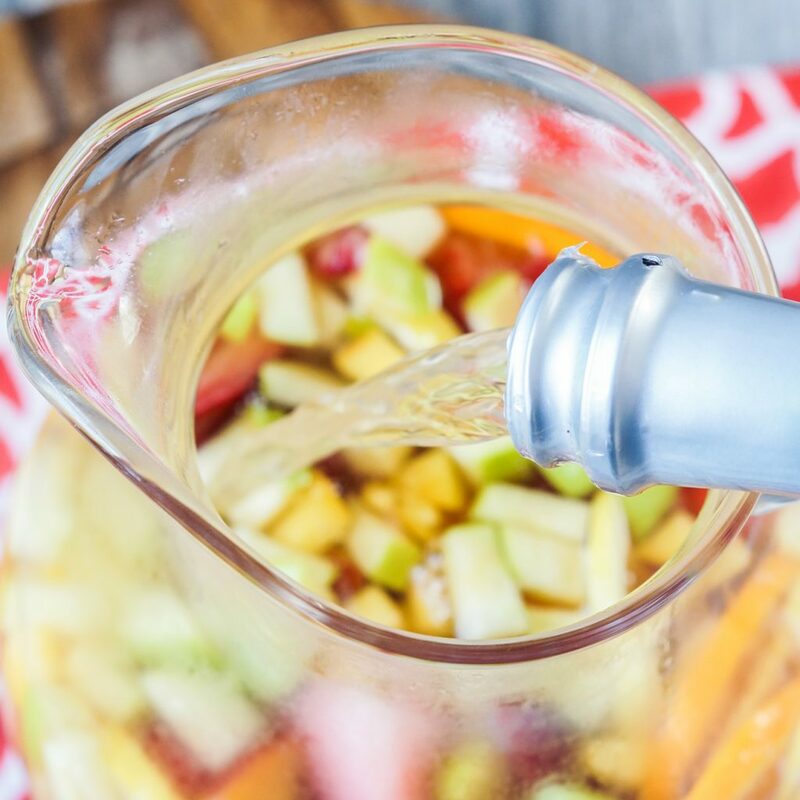 As summer continues to heat up, look no further than this Moscato Sangria for your Potluck Ideas, party, brunch, or even just a relaxing afternoon. 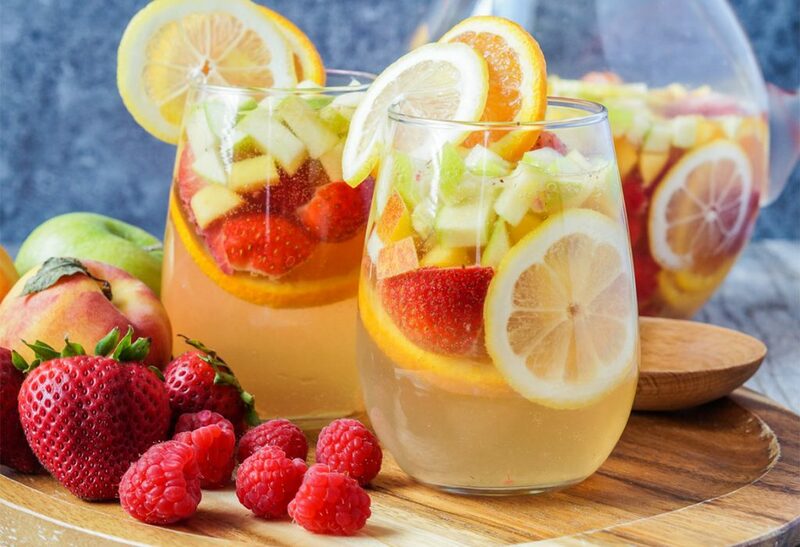 This light and refreshing Moscato Sangria is packed with fresh strawberries, raspberries, apples, peaches, oranges, and lemons along with a splash of brandy and vanilla for even more flavor. Disclaimer: This recipe contains alcohol. It is intended only for those over the age of 21 (in the United States). Please drink responsibly. What is a Moscato Sangria? Traditionally, Sangria, a Spanish cocktail, includes a combination of red wine, fruit, and spices. This Moscato Sangria is the perfect variation for summer. I paired light and sweet Moscato with brandy and fresh strawberries, raspberries, apples, peaches, oranges, and lemons. It comes together in less than 10 minutes and can easily be doubled to serve more of a crowd. My pitcher can fit about 2 bottles of wine. Yes, Sangria is sweet, almost like an adult fruit punch. 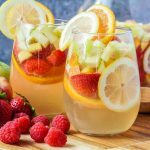 Our Moscato Sangria is a fun refreshing cocktail for warmer months like summer and perfect for a backyard BBQ where wine might feel a little pretentious. The fruit amps up the sweetness in the wine and also makes for a beautiful presentation. 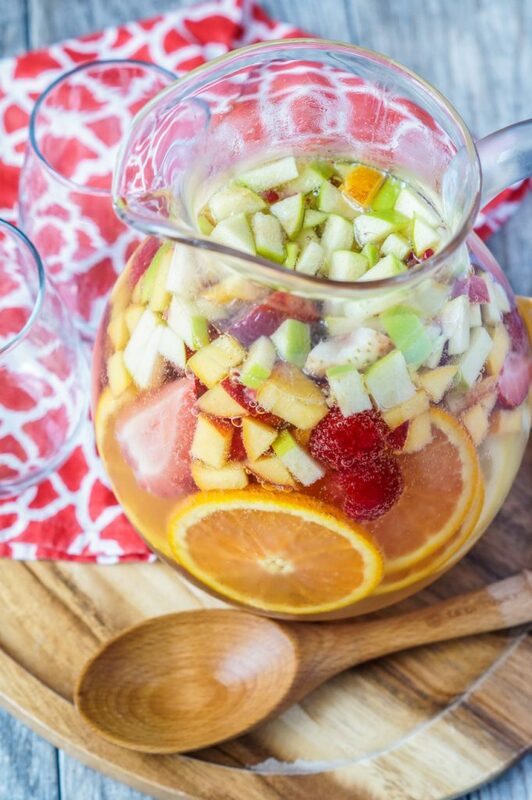 This Moscato Sangria will be a welcome addition to any summer potluck event. In a pitcher or large bowl, combine the Moscato, brandy, and vanilla extract. Add the strawberries, raspberries, apple, peach, orange, and lemon. Cover and chill for at least 2 hours. Serve chilled, if desired with ice and seltzer water. One of the best things about this Moscato Sangria is that you can adapt it based on what you have available. Don’t have fresh summer fruits? Frozen would also work well or switch out for your favorites. I poured in a large splash of brandy, but you can substitute with some orange liqueur or a flavored vodka. I often add a simple syrup to sweeten sangria, but this Moscato was sweet enough for us on its own. Sweeten if desired to taste. Allow the sangria to chill in the refrigerator for at least a couple of hours before serving to allow the flavors to blend. It is especially delicious after resting overnight. With the addition of the citrus, I wouldn’t let it go longer than a couple of days. To add some bubbles, combine with seltzer water immediately before serving. Want to add a festive touch? Use star or other small cookie/vegetable cutters to make shapes out of the apple slices. Looking for more Potluck Ideas? Welcome summer with a sweet and refreshing cocktail! Our Moscato Sangria is easy to make and a PERFECTLY pretty cocktail to sip all summer long! Oh, yum, this sounds delicious. I bet if you wanted bubbles you could even use Moscato d’Asti. I’m going to have to put some wine and fruit on my grocery list this weekend. Oh I could sip on this all summer long!! Thanks so much for sharing this sangria recipe! I am very much looking forward to trying it out!! This looks super easy to make, and I love sangria but I’ve never tried it with moscato. This needs to change! Just pinned this gorgeous number! And why am I not making these at least once every other week during the summer LOL. Thanks for the inspiration! My cousin and I tried making sangria once years ago. We had NO idea what we were doing and it was so bad that I’ve never had sangria since lol. BUT….I love Moscato and this recipe sounds too good not to try! This sounds and looks so refreshing. Now I can’t wait for weekend to make this for me and my hubby. 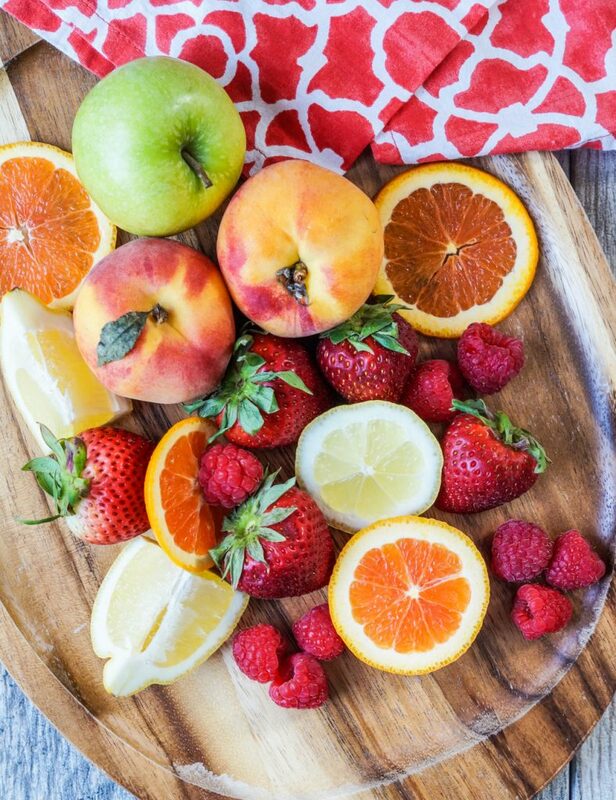 Love all the colorful fruits you used here. Just fab! This drink looks gorgeous! I need to make me one or two!